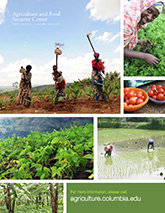 On September 29, 2011, the TropAg Program co-sponsored a meeting with Conservation International and the Bill & Melinda Gates Foundation to discuss the vision and need for an integrated global agriculture monitoring system. Over 50 participants attended, including scientists from TropAg, the Earth Institute, Conservation International, Wildlife Conservation Society, IFPRI, FAO, the World Bank, and partners from the private sector and foundations, including the Bill and Melinda Gates Foundation, Rockefeller Foundation, McArthur Foundation, Coca Cola, Monsanto, DuPont, USAID, and DFID. At the meeting, participants discussed creating this integrated global monitoring system. Policymakers, natural resource managers, and donors need good data, appropriate analytical frameworks, and risk management capabilities to make smarter decisions about managing agriculture and natural resources that jointly address productivity, environment and human wellbeing sustainability goals. Better integrated data and decision support systems are needed. This proposed monitoring system will provide quantitative measures, metrics, and synthetic decision-support indicators and tools to ensure that agricultural development does not degrade natural systems and the services they provide. Already, work has started on creating the Africa component of the monitoring system — known as Vital Signs Africa. For more information, see vitalsigns.org.